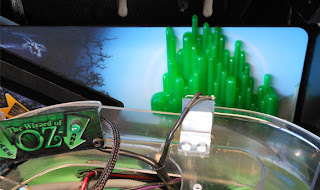 Back Alley Creations: The first Wizard of Oz pinball mods!! The first Wizard of Oz pinball mods!! Our first Wizard of Oz Pinball mod is here. For the next 24+ hours we will offer free shipping on it in the US only. Sale is good through tomorrow Friday 27th at noon central time (Chicago time). The mods mounts to the back panel over the artwork via double stick tape. It is a nice sparkle emerald green which has proven difficult to photograph showing all the sparkle to it. We are working on getting a video posted of it to show more of an exact color. This mod was originally made for the game but never made it to production. It is not going to be in the 75th edition but you can still own it now through us. 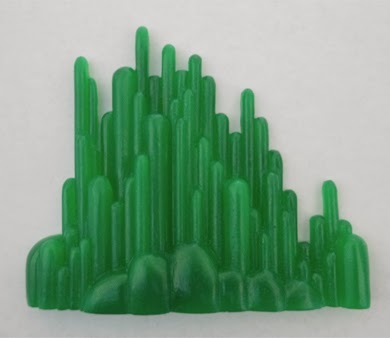 Click here to go to our site and click on the Wizard of Oz page.